NO – I was not one of those jumping around celebrating the arrival of the prince this week. Which Prince? We had two; first, we congratulated the British royal couple just as we do anyone else who begets a child or an heir. The British royal family is adored by even the ordinary British fellows who are adored by ordinary Ugandans, so it wouldn’t surprise me if some Kashaija in Kamwezi or an Ejakait in Soroti used the occasion to sip an extra bit of muramba or ajono. On principle, I attempted to prove that I was not one of the ‘colonised’ Ugandans who can’t do without tattling about celebrities in the UK and America, so I ignored the announcement of the wedding. Instead of watching the William-Kate wedding live on television as some people missed work to do, I was in office and meetings in the city. The pregnancy announcement ambushed me but I avoided the details until, very ironically, a Uganda online news site delivered a story into by inbox titled “Royal Pregnancy Something Something”. Because it arrived shortly after the Princess Komuntale wedding, and Buganda’s Prince Wasajja was soon walking his bride down the aisle, I was intrigued enough to read the story, and was three paragraphs into it before my confusion over the mentions of Kate cleared. To be honest, there is no amount of sensitisation, complaining or patriotism lecturing that will reverse the cultural disorientation we are going through – and not just in Uganda. One British publication, Private Eye, summed my thoughts up best with a front page bearing only the headline, ‘Woman Has Baby’ and the tag: “Inside: some other stuff”. On Twitter, a few of us cracked #namestheywontcalltheroyalbaby jokes and suggested, among others: ‘Sejusa’, ‘Aronda’, ‘Mbabazi’, ‘Besigye’ and ‘Semakookiro’ – thus Ugandanising this global story a little. Among the names was ‘North West’, which took me a while to work out till twelve hours later I realised that is a Princess of Hip Hop – the baby of Kanye West and Kim Kardashian – news that also came to me by way of a Ugandan online news site, the same one that told me about Hip Hop Princess Ivy Carter, of Jay-Z and Beyonce amid other updates about lots of non-Ugandan stuff. Another name suggested: ‘David Greenhalgh’, and we laughed because that would be most misguided of the Duke & Duchess of Cambridge, but then that night said Greenhalgh was in the news in Uganda. This is the man at the heart of the Bad Black and Meddie Ssentongo saga, complete with cuckolding, embezzlement, lavish parties and lots of contempt-filled energy from people like me. That day, Meddie Ssentongo was released from Luzira Prison and took a victory drive through Kampala in Soroti MP Mike Mukula’s Land Cruiser, the sight of which initially depressed me till I worked out that this was in line with the theme of the day. That’s the second – you see, Meddie Ssentongo is a Prince as well, in his own right, and I won’t befuddle the suggestion by joking that a person can be a Prince, his Kingdom Corruption, Capital City Embezzlement, Queen Black (Not Good); or that there might be a major power struggle for the position of Prime Minister in his Kingdom. I don’t know who the King is either. 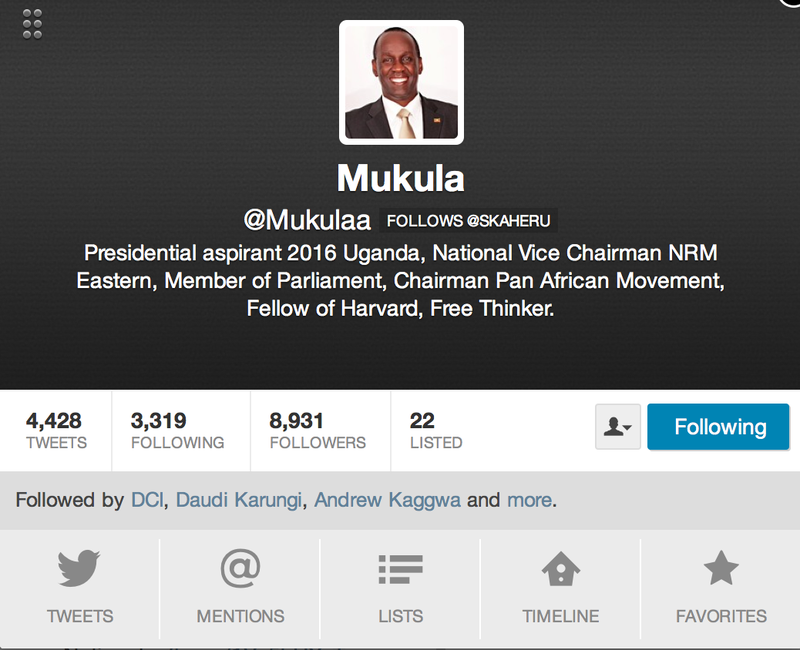 On Twitter, where his profile reads, “Presidential Aspirant 2016, National Vice Chairman NRM Easter, Member of Parliament, Chairman Pan African Movement, Fellow of Harvard, Free Thinker” Mukula explained that he was simply standing by Meddie because of the support Meddie had given him in Luzira. I suffer seriously from an ailment that makes me seek logic in the actions of others, and therefore spend more time than necessary feeling disturbed by such as what I saw on TV that day. I don’t want to be accused of being snobbish, elitist or Utopian, so I’ve got to say I am not against Mukula standing by Meddie. But I am against Meddie being given a Prince’s welcome because it shows us up, in general, as a society that celebrates the wrong values amongst us. What exactly ARE our values as Ugandans? Who are our heroes? And what is our definition of leadership in Uganda? Fixing this cultural disorientation in order to correct our national values is not going to be an easy task, and it’s made much harder when we have Princes such as the youngster from Cambridge being media-fed to us alongside Prince Meddie Ssentongo of Mityana via Bad Black of Greenhalgh chaperoned through the capital city by a national leader.